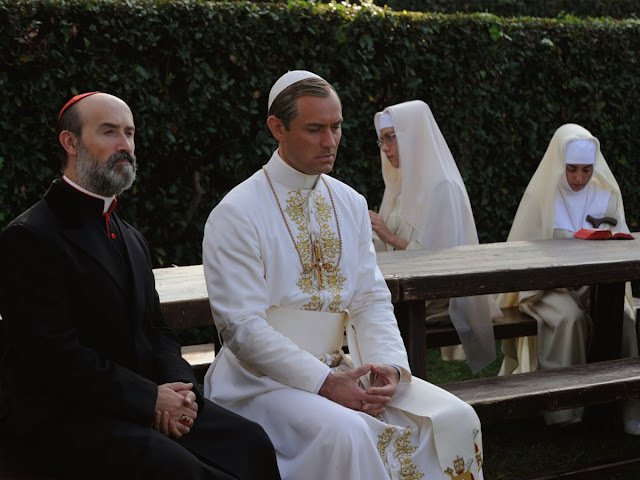 No Blogging for Old Men: The Small Screen: The Young Pope "Episode 10"
I have no idea if Pope Pius XIII will ever grace my television again, as there is no guarantee of a season two let alone a guarantee of Jude Law's return even if it does happen, but what we got here for these ten episode was pure excellence. The Young Pope turned out to be intense, bizarre, fascinating and consistently beautiful, both in technical terms with top notch sets, costumes, and camerawork and also in regards to its often times poetic and profound narrative. I have no idea what to expect and no real substantive expectations before the series began, but now I can say it was a pleasure to enjoy these ten hours of storytelling. It's funny, I am a huge fan of binge watching shows released in one lump sum on streaming services like Netflix and Amazon Prime, and yet here just with HBO deciding to release two episodes a week rather than the usual one, I feel like The Young Pope came and went too quickly. Only 5 weeks ago the journey began, one that initially felt like a silly premise primed to find its audience merely through shock factor and blasphemy, and now I am sitting here thinking how much I hope to see more in the future. If it doesn't return though, Paolo Sorrentino created a brilliant limited series with an ambiguous ending that I am still unpacking right now. The winning episode of the season proved to be the eighth but from top to bottom, start to finish The Young Pope was a hell of a watch. Even at its worst it was still good television.